St. Maarten / St. Martin is the smallest island in the world to be divided between two different nations. The island is split between the Dutch and French, and the two cultures live very peacefully together on 37 sq. miles. In fact, the island’s inhabitants are quite proud of their nearly 350-year history of peaceful co-existence. St. Maarten has an incredible year-round climate with spectacular landscapes and is renowned for it’s hospitality and an enchanting international ambience. Exclusive shops, culinary delights and amazing activities are just some of the things to satisfy every thrill seeker or casual tourist. There are virtually no limits to what you can see and do on this tropical paradise. Much of the architecture in Philipsburg, the capital of St Maarten, has a strong Dutch influence. Its main streets are lined with pastel colored houses adorned with elaborate carvings and wrought iron balconies. Historic sites on the island include a number of ruined forts. The best known of these is Fort Amsterdam in Philipsburg’s Great Bay. St Maarten and St Martin have very rich cultural environments. Attractions include many historic sites, Caribbean art galleries and fabulous annual carnivals. There are significant cultural differences between the French and Dutch sides of the island. Carnival in St Maarten is larger and more grandiose than it is in St Martin, and the restaurants on the French side of the island are among the best in the Caribbean. Detailed information about cultural events can be found in many free brochures available from tourist centers. 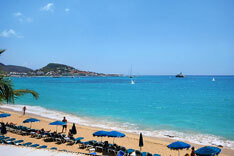 St. Maarten / St. Martin has 37 beaches that are secluded areas of beautiful white sand. All kinds of water sports are available including; windsurfing, swimming, sailing, jet skiing, diving and snorkeling. Half-day or full-day sailing excursions to undeveloped beaches nearby are also available. The stretch of beach that Mary’s Boon Resort sits on is one of the most pristine on the island. St. Maarten / St. Martin has the best of nightlife on both sides of the island. Casinos (on the Dutch side), nightclubs and dance bars are just some of the attractions available on the island. In addition, there are literally hundreds of fine restaurants to choose from, including The Tide’s Restaurant at Mary’s Boon resort is one of finest on the Island and we boast the fact that we offer the only beach side dining on the Dutch side. St. Maarten’s / St. Martin’s climate and natural beauty make it a perfect place for other types of sports and recreation. Golf, tennis, biking, horseback riding and hiking are just some of the other activities that allow you to explore the island’s natural splendor.